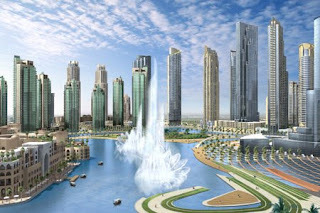 Emaar Properties said on Monday it plans to build one of the largest fountains in the world as the centrepiece of its Downtown Burj Dubai project. 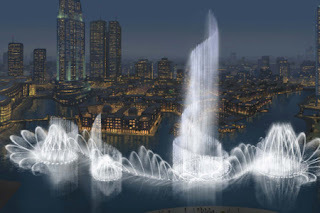 Arabian Business reveals what the real estate giant has in store.The fountains, which has yet to be named, will be capable of shooting water over 150 metres into the air - the height of a 50-storey building - and stretch over 275 metres - the length of two football fields. The fountains will shoot 22,000 gallons of water in the air at any given moment and feature over 6,600 lights and 50 colour projectors.